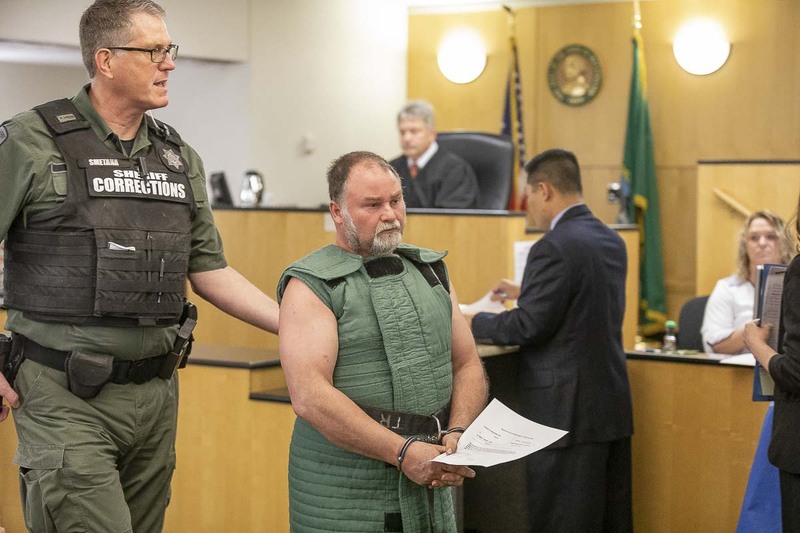 VANCOUVER — Wearing a green suicide-prevention vest, 47-year old Randy John Schmidt appeared in Clark County Superior Court on Wednesday morning. 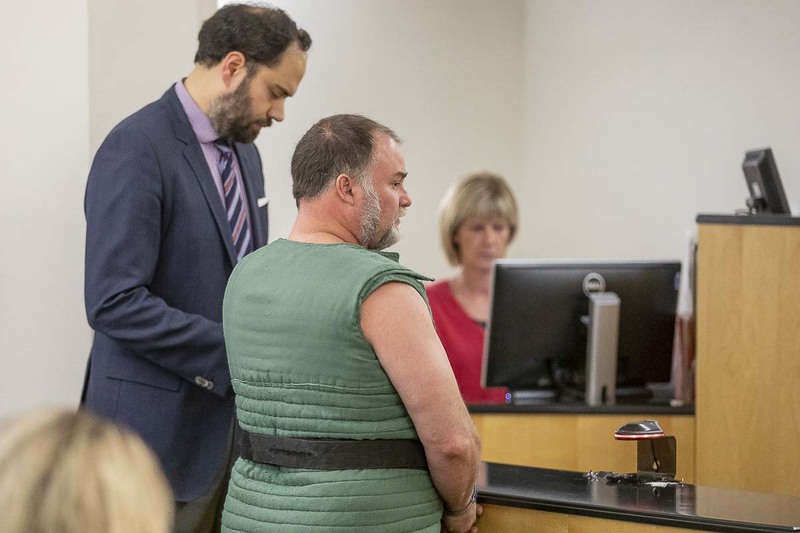 Schmidt is facing a charge of second-degree murder in the death of 52-year-old Michael Chad Holmes of Camas. According to a probable cause affidavit, Holmes got into Schmidt’s tan-colored GMC Yukon around 3 p.m. on Feb. 5. His family told investigators Holmes left behind his wallet, dinner cooking on the stove, and his beloved dog who was about to give birth. Shortly after they left, the dog went into labor and family members called Holmes to ask him to come back home. He didn’t answer. Around 6 p.m. Schmidt returned, wearing different clothes and driving a different vehicle, saying Holmes had gotten out of the car at Riley and Blair Roads and walked away. “Witnesses report Randy Schmidt was acting unusual the day Michael Chad Holmes disappeared,” reads the report from Clark County Sheriff’s detective Adam Beck. According to Beck, Schmidt told detectives he drove the Yukon to Ridgefield and parked it after Holmes left. He said he sold it two days later, but couldn’t name the buyers or show proof of the sale. Witnesses reported seeing the vehicle in Ridgefield the week Holmes went missing, and described damage consistent with what his family had described. The previous owner of the Yukon also confirmed he sold it to Schmidt. The Yukon was discovered submerged in the Lewis River near Paradise Point State Park in early March. Beck said blood discovered in the front passenger seat was a DNA match for Holmes. After that discovery, Schmidt reportedly told detectives that he and Holmes had gotten into a fight in the vehicle and that a shotgun on the floor had accidentally discharged, killing Holmes. “Randy told us the incident was an accident, and he did not intend to kill Chad Holmes,” reads the affidavit. Schmidt told detectives he panicked, dumping Holmes’ body in the Washougal River. Evidence from a search warrant also linked him to the area near where the Yukon was dumped. Detectives continued to investigate Schmidt after the vehicle was recovered, learning he had fired at an occupied vehicle on his property seven years ago. He also allegedly shot several storage containers belonging to Holmes last year, stealing the contents. Senior Deputy Prosecutor Kasey Vu asked Judge Daniel Stahnke to impose a $1 million bail, noting his history of gun use. “He has interfered and will continue to interfere with the administration of justice,” Vu said. The judge imposed a $750,000 bail, with Schmidt’s next court date set for April 18. “I have been abandoned by my family,” noted Schmidt, in telling the judge he could not afford to hire an attorney.